Franklin County vital records may be obtained from the St. Albans city clerk, who can be contacted by phone (telephone 802-534-1500 extension 264/265; fax 802-524-1516), or by email s.krupp@stalbansvt.com. Office hours are 7:30 am to 4:00 pm, Monday to Friday. 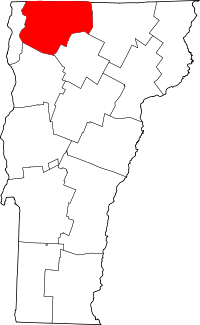 It should be noted that every town clerk maintains birth, death, and marriage vital records, so genealogists may also want to contact the clerks of other Franklin county towns (Bakersfield, Berkshire, Enosburgh, Fairfax, Fletcher, Franklin, Georgia, Highgate, Montgomery, Richford, Sheldon, and Swanton) or the Vermont State Archives. Divorce records are obtained from the clerk of the court where the divorce was granted.